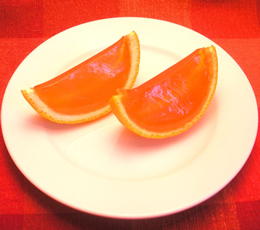 Thank you to our Featured Foodies at duodishes.com for this amazing, innovative way to serve jello shots! So much more practical (and much better presented) than a little cup. Set orange halves tightly in a container just big enough to fit all six. Whisk together Jello, water, juice and vodka until combined. Pour into orange halves and carefully transfer the container to the fridge. Let set at least four hours or overnight. Slice into thirds or fourths and serve.